ALL THE WALL RANGES ARE OUT OF PRODUCTION FOR MOULD REPLACEMENTS NEW STOCK EXPECTED IN MAY. All figures shown are 15mm scale for comparison purposes and they are not included in the sale of the model building or terrain piece. W1 Straight 80 mm long. W1d Damaged straight 80 mm long. may be cut from the wall to fix open. W1c Corner 38 x 38 mm long. W1cd Damaged corner 38 x 38 mm long. W1gp Pair of gate posts 24 mm high otherwise same as W2gp. by omitting two opposing straights. W2 Straight 80 mm long. W2d Damaged straight 80 mm long. W2c Corner 25 x 25 mm long. W2cd Damaged corner 25 x 25 mm long. W2gp &W2g now out of production soon to be replaced. require fixing to adjacent walls. 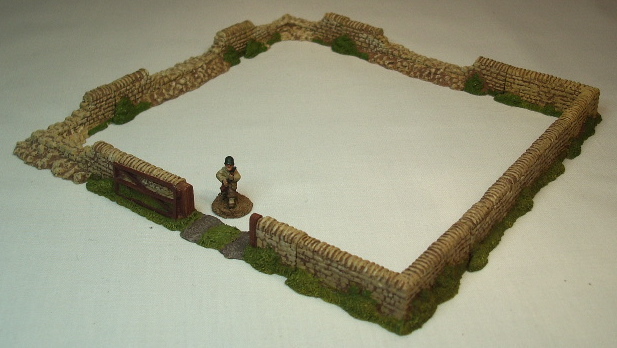 W2g A pair of double gates, 23 H x 34 mm W.
14 mm high walls with rough vegetation along the bases - different on both sides and so reversible for variety. price £0.60 per item and £4.80 per Field Set. RWS Straight 80 mm L.
RWSD Damaged straight 80 mm L.
RWC Corner 35 x 35 mm L.
RWCD Damaged corner 35 x 35 mm L.
RWG Straight section with a central gateway 80 mm L.
RWCurve Curve 80 mm L. see photo below left. RWS x 3, RWC x 4 & RWG x 1. Photo left shows two Curves joined together. All models and images are copyright Tiger Terrain 2014 -18.